Winslow Homer’s The Dinner Horn captivated my eye at first glance. Thereafter, whenever I visit the DIA, I seek the woman dressed in red, a small horn angled upward from her hand and mouth. My old soul is familiar with the planked porch adorned with potted geraniums and shaded by a trellis of vines. Day’s end glows upon the white hem of the cook’s long petticoat. I know her posture, left hand upon her hip, calling her folk to their table. Within the context of my southern matriarchs, I’ve heard and witnessed this domestic vignette in similar poetic compositions. 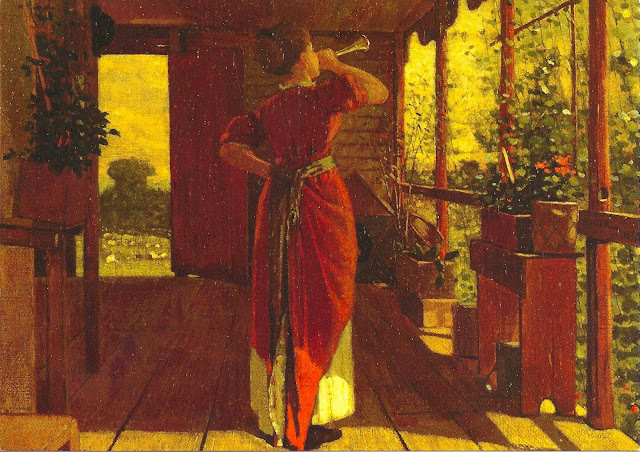 In Homer’s time, The Dinner Horn portrayed our young country after the Civil War. The grazing sheep in the background speak of restored serenity and plenty. Before and during the Great Depression, my maternal grandmother called her men and boys from cornfields by the pull of her dinner bell. She thought those were hard times until World War II took her four grown children to the city. That all but silenced the communal call to supper in the McCoy Bottom. In my childhood of the early 1960’s, Mom hollered for my sisters and me from our small concrete porch in our Warren suburb. We weren’t allowed to play past the Zablocki’s four doors down and the Antico’s four doors up the block. An “outward looking artist” who appreciated the sphere of Nature’s elements, I wonder if Winslow Homer would’ve found our manufactured neighborhood picturesque. Would his eyes have seen our individual and collective narratives, our quest for home? 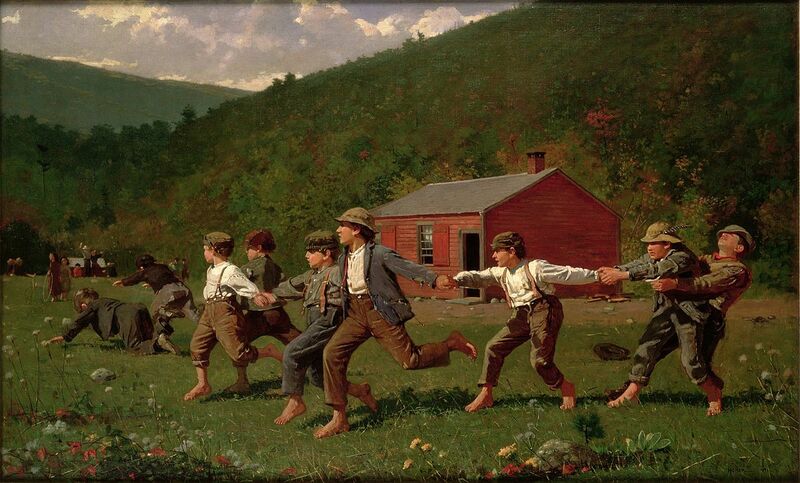 Would he have painted the circle of children on our small patch of lawn when we sang "Ring around the Rosie?" “I prefer every time a picture composed and painted out-doors. The thing is done without your knowing it,” Homer said in The Art Journal, 1880. Two years later he painted Snap the Whip, the only painting I remember displayed in my father and stepmother’s house. Forty years ago, unaware of Winslow Homer, I thought it strange that Dad would find interest in a large copy of bare-footed boys playing a game in a meadow. My father moved us to Detroit in 1954 for a better life and never spoke of his childhood in Thacker Hollow, West Virginia. At last, it was the mountain range rising up behind the red schoolhouse in Snap the Whip that offered a clue. Now I understand Dad needed and loved what he saw in Homer’s story. It spoke of his boyhood companions and agrarian heritage. The mountain spell never faded from his memory. Perhaps this explains why he grew a vegetable garden in his latter years. The edges of the old and new had made their peace. “What a great school Nature is when the pupil is a persistent searcher for truth and has the strength of purpose to find adequate forms of expression,” Homer wrote. Dear Reader, in this world of endless edges, our beloved American impressionist calls us home to our table and outward into Nature to see what we love.